A dying 39-hectare lake, which used to be a rich fishing ground among local folks in Cabiao, Nueva Ecija, will be converted into a Php20-million eco-tourism park to boost domestic tourism. The revival of the Nabao Lake, spanning barangays Sta. Rita and San Carlos, was the focus of the 5th Paistimika Festival highlighting the town’s 167th foundation anniversary. The event was marked by the opening of a pier and a fluvial parade last Friday which ran up to Tuesday, spearheaded by the municipal government and participated in by the Department of Education, teachers, students, senior citizens, government employees and the citizenry. The Department of Environment and Natural Resources and the Manila Bayanihan has released an initial Php1.2 million for its development plus a counterpart funding from the municipal government. In 2013, Crespo-Congco and Vice Mayor Ernesto Talens Jr. launched the Save Nabao Lake movement to revive the lake. Congco said the lake used to teem with aquatic life with local people feeding on an abundance of fish in the area. 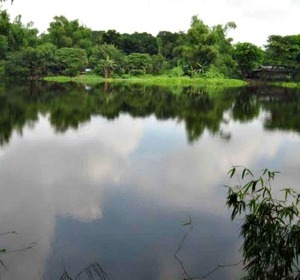 “I recall that my uncle used to swim in the waters of Nabao Lake and catch fish here. It was really historic because many people survived from its abundance of fish,” she said. She said that at present, the lake, situated two kilometers from the town proper, is covered with water lilies and informal settlers have set up houses around the area. Congco said sometime in 2004, she was able to exercise political will in removing squatter colonies which have mushroomed in the area but they were able to return when a new administration came in. “What we want is to restore Nabao Lake to its old, pristine beauty and turn it into a recreational area because actually, it is a paradise in itself, a gift from God,” said Congco, who returned to the town hall in 2010. She added that in the long haul, what her administration envisions is the formation of a Nabao Lake Development Authority which is similar to the Laguna Lake Development Authority (LLDA). The plan is to link up with Gawad Kalinga to set up houses in a nearby two-hectare area to relocate the informal settlers around the lake. Crespo-Congco, Talens and local folks were joined by Sen. Cynthia Villar in the fluvial parade in the lake where they launched the “Lawa ng Nabao Munting Paraiso (Nabao Lake Small Paradise)” project. They also released fingerlings in the lake. The municipal government is planning to tap Villar’s office to make use of water lilies in the area for her pet livelihood project. Talens said what makes the lake a potential tourist spot is its being a natural lake. “Other lakes are man-made but this one is natural,” he said, adding local folks are excited over its prospects to be developed into a tourism destination. He said that next year, the municipal government is planning to sponsor a boat race and other water sports-related activities. This town used to be a barangay of the once prosperous empire of the Capampangan settlement Candaba. It was established as a municipality of Nueva Ecija on February 9, 1848 in an order issued by Governor General Narciso Claveria.